Preface. Analytical Tools. Introduction (J. Behrman, T.N. Srinivasan). Data and econometric tools for development analysis (A. Deaton). Human resources: Empirical modeling of household and family decisions (J. Strauss, D. Thomas). Applied general equilibrium models for policy analysis (J.W. Gunning, M. Keyzer). Resources, Technology, and Institutions. Introduction (J. Behrman, T.N. Srinivasan). Savings, credit and insurance (T. Besley). Technological change and technology strategy (R.E. Evenson, L.E. Westphal). Institutions and economic development (J.Y. Lin, J.B. Nugent). Poverty, institutions, and the environmental-resource base (P. Dasgupta, K.-G. Mäler). For this Handbook authors known to have different views regarding the nature of development economics have been selected. The Handbook is organised around the implications of different sets of assumptions and their associated research programs. It is divided into three volumes, each with three parts which focus on the broad processes of development. and the private sector to guide resource allocation to a much greater extent. As well as updating developments on topics which were included in the earlier volumes, this Handbook also includes different topics, such as econometric and other empirical modeling tools for development analysis and the role of technology in the development process. As in the previous volumes of the series, the chapters in this Handbook provide self-contained surveys summarizing not only received knowledge but also recent developments. Each chapter is also a definitive source, reference and teaching supplement for use by researchers and advanced graduate students. @qu:...this is a wonderfully stimulating and comprehensive collection of essays on development economics. It deserves to be on the shelf of every serious scholar of development economics and to be closely read by graduate students working in the area. @source:Economic Record @qu:If one ambitiously attempts to make an overall evaluation of these two volumes, one must conclude that the two volumes are excellent and extremely worthwhile for all readers who are interested in development economics. Not only are almost all important problems tackled and very well presented in these two volumes, but also one learns how difficult the various problems of developing countries are and how difficult it is to achieve certain progress in the development of such countries. All chapters have an extremely good reference list so that one easily finds more literature should one desire to study specific problems. @source:Journal of Economics/Zeitschrift für Nationalökonomie @qu:.... an impressive accomplishment. @source:Journal of Economic Literature @qu:..."One can reasonably expect all development economists to consult this volume extensively, but, as should now be clear, there is something here for everyone. The quantitative tools certainly have applicability beyond development economics, and the thought-provoking chapters on institutions and land will be of wide interest." 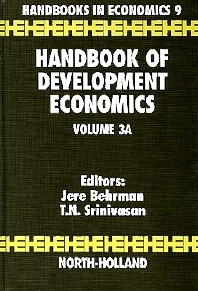 @source:Economic Record @qu:The two sections of the third volume of the Handbook of Development Economics edited by Professor J. Behnnan and T.N. Srinivasan will certainly be regarded as major reference works by students, teachers and researchers.